you find yourself looking at the political propaganda that comes through the letterbox to find out who printed it. I will admit I did first poke fun at the headline, something about the VAT rise affecting everyone in my area. No you don't say, I thought this region was exempt. Grrrr, I am really not that thick thank you very much. Then I noticed the paper was what I wanted to print my foundation patterns on. Of course being political the odds are that the printer gave them a discount in return for some advertising and I was right. There are contact details for the printer so I will get in touch and see what the cost of printing foundation papers would be. I'm not sure I really want to support a printer who does political campaigns but I've been struggling to find anyone to do what I need so I guess it doesn't hurt to ask. I finally feel I am getting back into a routine. I know it won't last but for now it's pretty good. Yesterday I managed to get a customer quilt done and sort out some of my travel plans. It's always a bit og a shock how complex that becomes. It seems simple to just book a flight from X to Y right. Except I am looking for the absolute cheapest option. Of course that means you have to factor in baggage allowances and travel to the airport. By the time you start considering the cost of fuel and parking for a further airport against a more expensive flight closer it really does get to be an interesting problem. Once you've figured out the best plan (and frankly it it's for your holiday go for easy your time is worth more than you will save with calculating all the different options) you need to persuade a website to take your booking. I think it took 6 attempts and 2 computers last night for that one. I do think I got the absolute cheapest option though, which is really important when you are spending other peoples money. After that I moved on to trying to book a ferry. Again how hard can that be. It is simpler that flights, as there are less options, but you still have to weigh up cost, potential delays, and the timings of events. Then I had to state the size of my vehicle, in metric. Hmm, interesting. Did you know a tape measure that is great for quilts is not so good for motorhomes. Oh you did, well why didn't you tell me. Or perhaps suggest I should have measured my van on a nice dry day just incase? Well I did need to measure it and I did know I should but I wouldn't have picked late and night in the pouring rain. Still I've done it now and I can see exactly how tight the barrier at Pacific Plaza was. I'm glad I didn't know that at the time. I guess I should go and get on with the next quilt in line now. It's loaded so I just have to make the sewing happen. I am trying to get all my customer work cleared as fast as possible, and at the very least before I start heading off all over the country. At last I am back on a proper computer. It´s even mostly working. It has still got a few quirks though so bear with me. The van is also fixed, in fact better than it was. The alternator has been replaced and we have had habitation serviced. So in theory I have working hot water, oven and electricity. The latter still needs some work to get it to where I need it, but hopefully that will be done this week. We even got the van a new set of tyres! Classes have restarted and seem to be going well. Another group are tackling my new mystery quilt and the first batch have nearly all finished it. Sadly I can show you any as that would rather spoil the mystery. However it will be being released as a pattern so if you want to find out what it looks like you could always make it. Yesterday I had a return booking with Chiltern Quilters. I last saw them in 2007 so I was able to take a good selection of new work for them to see. It was great to have so many friendly faces for my first talk of the year. I was shocked how rusty I was after a month off. I hope they enjoyed it, I know I did, thanks for lunch too, it was great to be able to eat between unloading and speaking. It was also good to see another Starr Designs quilt there as I took Holiday Starrfire with me this time. Next weekend I will be heading up to Nene quilters, hopefully I will be more in the swing of things by then. As well as being rusty I found the talk yesterday really took a lot out of me. It may also be related to being ill last week, but today getting the tyres fitted to the van seemed like quite enough activity. I could be taking this weekend off and playing board games up in Manchester. On the other hand I have a lot of work to do so I decided not to go. Even this morning I wasn't sure I had made the right choice. Tet also decided to stay home and get things done. It turns out this was the right answer. We decided to brave Costco for cat food and new phones and took the van. It is easier to load than the car. On the way there the battery light came on. Yes we could believe the alternator was on it's way out and decided that actually before I started out on the longer tours it would be good to have a new one, and a fan belt. As we left Costco there was a rattle and a couple of clonks. Not good noises. No sign of anything obvious though. We thought a bit and pulled over again. Could the nut holding the pulley on the alternator have fallen off? If it had how much damage could that pulley do when it came off? Yes and surprisingly little it already had. We were about to drive the last couple of miles home when the penny really dropped with me (what can I say I was feeling ill it's why I wasn't driving). The heater is usually good but was cold, no functional fan belt doesn't just mean no electricity it means no cooling. We got the engine off just as it overheated. As we had chosen our spot to pull over we could wait safely for a recovery vehicle. However, if we had gone to Stabcon this would have happened on the motorway. We wouldn't have had the chance to pull over and think to not only would we have broken down, on a motorway we would probably have done a lot more damage too. I'm really glad I decided to work today, even though I lost more of the day than I had planned. This quilt went home today, so I can now share it. It was one that made me think. I didn't get to talk it over in person with the owner, but she had sent me a clear set of instructions. I like that, even though it is also a bit scary as it shows they have quite good ideas of what they want. 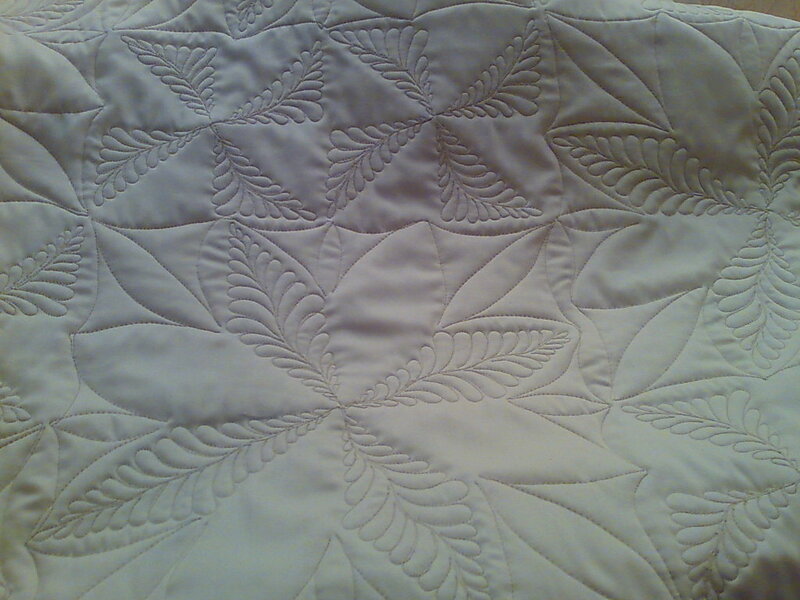 The backing is a lovely satin sheet, and the customer mentioned she would like this quilt to be reversible. 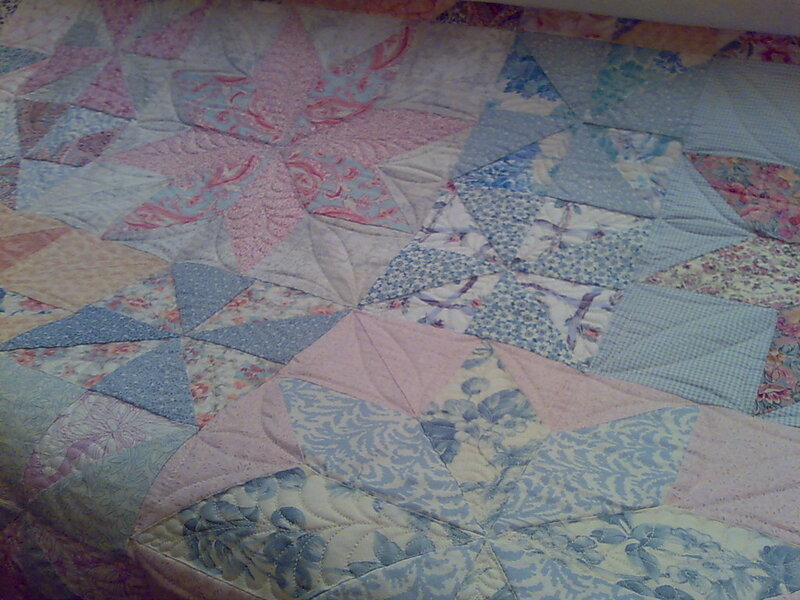 That didn't bother me too much as I often think that quilts could be reversible even if that wasn't the idea. She was also looking for a pattern that was organic, and not too modern. The first two pictures show you the back of the quilt as I eventually did it, but this wasn't any of the first ideas I had. 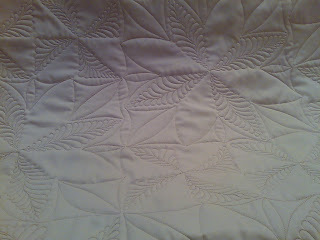 My initial idea after reading the instructions was to put feathers all over the quilt. That would give a nice organic look to the quilt, and would be fine as a wholecloth on the back. Then I looked more at the front of the quilt. That pattern is a lot of work, could I really put an all over pattern on it. 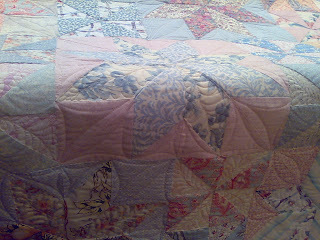 I concluded this wasn't a quilt I could work on without more information so I called the owner and talked about it. A lot of the credit for the end result has to go to my customer. She picked up that I wasn't quite happy with the idea of the all over pattern. We were both happy it would have been OK, maybe good, but was it the right answer. She sent me off with freedom to talk to the quilt again and come up with something that would really set off the piecing. We are both pleased with the result. 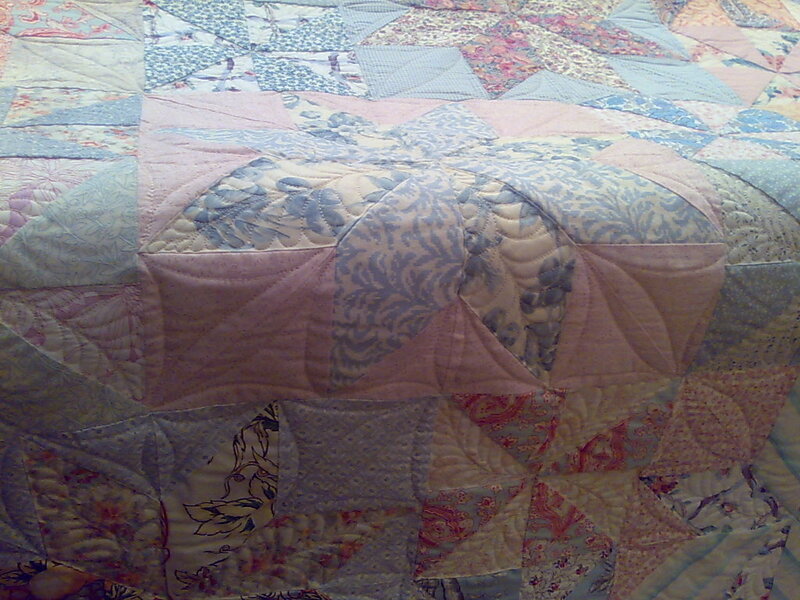 The pictures don't pick up all the texture the quilt has. It has a range of different fabrics, and now it also has very defined raised areas. Of course I couldn't see the back until took the quilt off the frame. 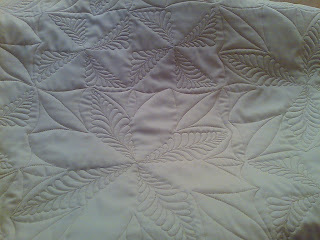 I had been a bit worried that the points where the quilting lines met wouldn't look right but it did come out fine. The thread on the back is a slightly darker shade than the fabric which means it does show up quite strongly, which is why I was concerned. If it worked I felt it would give a better wholecloth, but of course if it went wrong it was going to be very obvious. Yes those little feathers did take a very long time. OK, so I guess that is how you do it, you tell people there is a deadline and they contact you :) So the lucky winners were, Rafael's Mum, Sally Westcott, and Joyce. I hope they will all have fun watching the shows. There are usually a few free shows you can have a look at at The Quilt Show if you are interested. I am often surprised by how much I learn from the shows. In other news, today was the first day of term, which is always unreasonably tiring. It was fun to get back to it though. My students had kindly saved plenty of questions for me over the holiday. That's kinda exciting as the questions are getting more interesting every year and their progress is much clearer when you haven't seen them for a while. Now I've had a chance to sit I have both quilting and unquilting to be getting on with. From past experience this is now the tricky bit of giving things away on a blog. I've sent out the emails and I will wait for replies. If I don't hear by the end of the week I will pick again on the grounds that the address I've got hasn't worked. Once I have managed to get in touch with three people I will let everyone know who got the gift vouchers. I've finally had time to watch The Quilt Show Legend episode for 2010. The name Yvonne Porcella didn't ring any bells so I hadn't been desperate to see it. As the show started I was a bit disappointed, I've really loved the other years legends. 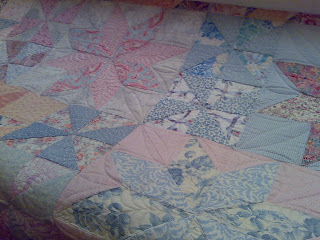 The problem was most of the quilt just didn't talk to me. However, as the show went on I did get more into it. She is just great. Sorry but I can't see me ever loving her work (except the one in the Smithsonian) but her attitude and the things she has done really appeal. She has done her thing her way and been recognised outside of the quilting world. I find it interesting that the least promising show (for me) has turned out to be the most inspiring one too. I wasn't too interested in the techniques, but still came away with some things to try and I've learned a lot about how I want to move forward. You never know where the next good idea is coming from. If you are not already a star member of the Quilt Show and would like to try it, I got a couple of gift certificates free when I renewed. If you would like one leave a comment and I will pick some people to gift them to.